This gets my vote for prettiest Lush bubble bar. This is lovely and smells of rosewood, cedarwood and lemon oil. It smells sweet and lovely. Lovely, delicate pink bubbles. It’s more conditioning than most lush bubble bars. This leaves a silver- pink glittery shimmer in the water. This bubble bar has the whole package. I was surprised that it made the bath water moisturizing as well as fairy-like. It smells slightly perfumey, and woody, but the woodiness is tempered by the bright lemon. Here’s a demo video I made of the Cherry Blossom in the bath. 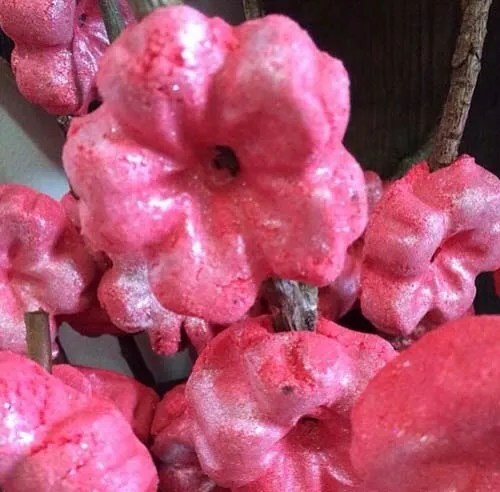 Posted on September 2, 2015 by Lushalot	• This entry was posted in Bubble bars, Lush Oxford Street store exclusives and tagged bubble bar, cedarwood, cherry blossom, lemon oil, oxford street bubble bars, pink, Rosewood. Bookmark the permalink.